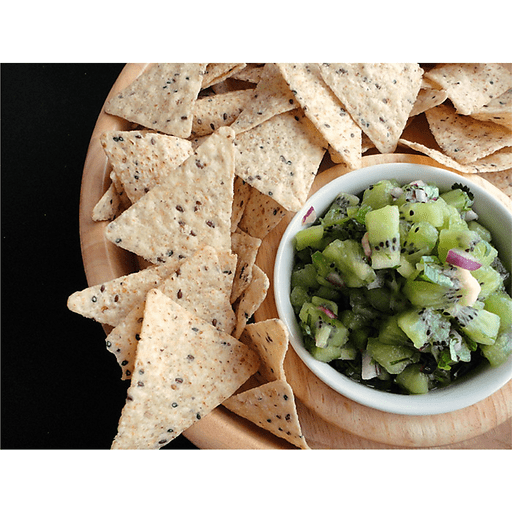 This salsa is incredibly simple. All you have to do is cut up the fruit and veggies, toss with lime juice, and season to taste with salt and pepper. 1. Add all ingredients to a medium bowl and toss gently to combine. Add salt and pepper to taste. 1. Serve with tortilla chips or as a topping for grilled fish. If you like it really spicy, use two jalapeño peppers. Calories 60, Total Fat 0.5g (Saturated 0g, Trans 0g), Cholesterol 0mg, Sodium 55mg, Total Carbohydrate 15g (Dietary Fiber 3g, Sugars 9g), Protein 1g, Vitamin A 4%, Vitamin C 150%, Calcium 4%, Iron 2% *Nutritional values are an approximation. Actual nutritional values may vary due to preparation techniques, variations related to suppliers, regional and seasonal differences, or rounding.